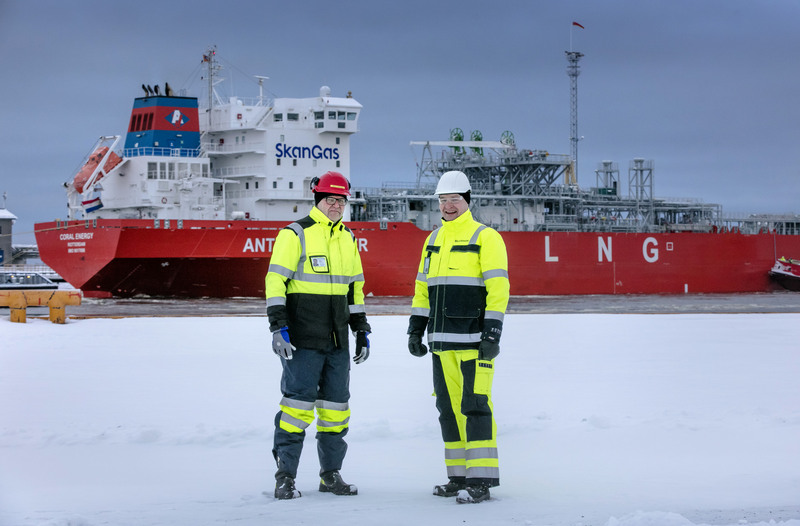 The historic first shipload of liquefied natural gas to the Manga import terminal in Tornio, northern Finland, comes from the Barents Sea. There was rejoice in the new terminal in Röyttä Harbor, Tornio, as tanker «Coral Energy» this weekend arrived with about 15 thousand cubic meters of liquified natural gas on board. It is the first shipment of LNG to the terminal which soon will be the biggest of its kind in the whole Nordic region. «We’re strengthening Finland’s energy independence and our position as a leading LNG player in the Nordic countries,» says Skangas CEO Kimmo Rahkamo. «It’s a historic moment», he underlines. The Manga LNG natural gas import terminal is a joint venture of the industrial companies Outokumpu and SSAB Europe, the energy company EPV Energy and the LNG company Skangas. Once completed in summer 2018, it will be the largest LNG terminal in the Nordic countries and the second LNG terminal in Finland, a press release informs. The facility will help diversify the regional gas and fuel market and serve the entire Bay of Bothnia region, including industrial and mining companies and the regional marine and heavy road transport sector. Also Northern Sweden and Northern Norway will benefit, the company says. Commercial deliveries to customers such as Outokumpu Tornio Works, EPV Energy and SSAB Raahe is to begin in summer 2018. The LNG delivered by the «Coral Energy» has its origin in the Barents Sea. The ship in late October picked up the natural gas at Statoil’s Melkøya LNG plant in Hammerfest, the Norwegian town on the Barents Sea coast. It was Skangas’ first small-scale LNG loading Melkøya. The operation was conducted at the large-scale terminal jetty normally used bigger-size LNG vessels, gas company Gasum informs. The «Coral Energy» is a small to medium-scale LNG carrier with a capacity of 15 600 m3.